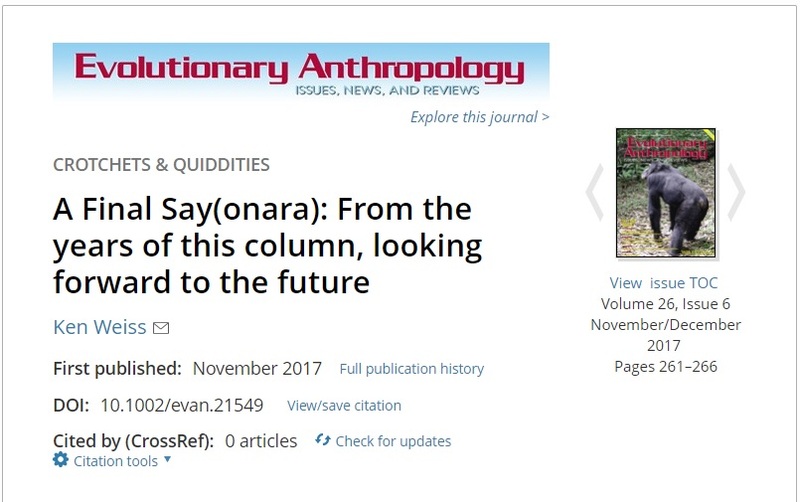 Since 2001, our very own Ken has been writing thoughtful, illuminating, and mighty thought-provoking essays in Evolutionary Anthropology, and in November's issue he wrote his last. I began this series by explaining my curious title for the series: crotchets are eccentric or idiosyncratic opinions and quiddities are philosophical quirks or even intangible ideas. I said that I wanted to “examine some of our assumptions, to simulate thought about them.” I have hoped to stimulate readers to think about things evolutionary for themselves, because I think we are all far too prone to expound neat or convenient stories as if they were true, when Nature often seems to be a lot more frustratingly complex and subtle. As a young graduate student, when he started the column, I remember thinking how radical his ideas were and wondering how on earth I could ever get to the point of being so creatively curious, of having enough knowledge to provoke so much valuable insight, and enough generosity and audacity to share it with others. It wasn't easy gunning for a glimpse from his point of view while I could barely keep up with my fundamental grad coursework, but Ken's bigger messier reality, compared to the controlled minutia of my paleoanthropological research, was a major part of what kept me going, and what kept me sane too if that makes any sense. You might imagine how rewarding it was for me to eventually co-author two C&Q columns with Ken. During these many years of C&Q columns, only some of us were lucky enough to regularly have Ken's influence in person in the halls, labs, offices, and classrooms of Penn State's Carpenter Building where the Anthropology Department lives. But the C&Q column extended his spark and spirit out of Carpenter and into our community so vividly that readers must feel like they too can call Ken their professor, their mentor, or their colleague based on the relationships he forged with their brains on those pages. If you somehow missed out, all his columns are archived in one spot for convenience at the end of Ken's last, right here. It's the end of an era, but not before it was the start of something beautiful, first! Now, if they don't already, please let C&Q readers know they should continue to benefit from Ken's insight here, on the Mermaid's Tale, with the rest of us. As Ken has written, "It's a thought, at least." Despite incongruous hand proportions, Trump has long been compared to one our closest relatives, the orangutan. Even if Bill Maher hadn’t popularized the likeness (about which, Trump sued him), and even if Trump wasn’t tinted like the lovely orange primate, people were going to go there. It’s what we do. When we’re not photoshopping our leaders into Hitler, we’re calling them apes. But you don’t see much joking about a primate presidency anymore. Any comparisons to apes now are decidedly unfunny. When Jane Goodall got involved--and she can be hilarious--it got serious. It’s easy to see why folks have lost their senses of humor about Trump. For coping, the adage ‘If you didn’t laugh you’d cry’ is so 2016. As I like to sing along with Roger Waters, “You're nearly a laugh, but you're really a cry.” I cry every time Trump grins through the GOP’s favorite tune “You Can’t Always Get What You Want.” I cried when he took credit for Christmas. And those are just the peccadilloes! Worse than the peccadilloes are the ape jokes. As mirrors for humanity, apes are brilliant. There is so much room for humor here, but it’s been the domain of racists for so long that even good-natured silliness about someone’s ape-ness is tainted. If you don’t understand or disagree, then you’re probably white and have no experience as touchstone here. One way to take a peek at what’s going on out there is to Google “Obama ape” and look at the images and their sources. Go ahead and Google “throwing bananas” too. What you see is just a snippet of the sordid legacy of generations upon generations of modern science-inspired racism that has weaponized our shared evolutionary history, humankind’s sacred origins story, against ourselves. [Please join me in exhaling a “fuuuuck youuuu” to no one in particular.] This baggage is grounded in ignorance, misunderstanding, and biased narratives masquerading as facts. So, to be terribly brief, there’s a mound of garbage that comes with calling people apes. I look forward to the day when all humans, no matter their geographic ancestry, can giggle good-naturedly about their ape-ness without even a twinge of a memory of some old fart’s racism. By the way, apes have a leg up on us; they’ve got senses of humor and they don’t got racism. Now that we’ve all spent at least a year obsessing over everything Trump says and does, it should be clear to anyone who’s spent a lick of time with an ape that there is no ape like Trump. Though, make no mistake. Trump is an ape. We all are. Or, he isn’t and we all aren’t. It’s really a matter of whether you prefer the label or not, whether you think humans have evolved into such a weird ape that we no longer deserve the name any more than we deserve to be called monkeys or fish. For some, “ape” is recent history. To others, ‘ape’ still applies. Either way, everyone agrees that we’re mighty similar. So, despite my reservations about the jokes, I’m resuscitating the Trump-ape theme here, but with a twist. Here’s why. My social media feed is obsessed with speculating about what Trump is thinking. I empathize because I too would like to know, but also because this relentless, seething curiosity is very much like mine when it comes to Koko the gorilla. If you’re unfamiliar, I’m talking about a world-famous primate, known for possessing rudimentary language skills, who was supposedly raised as a human. 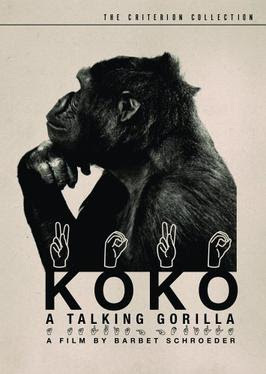 I would love to know what Koko’s thinking, and journalism seems to be at odds with my goals. For many, journalism is equally frustrating when it comes to Trump. About a week ago, the New York Times posted a transcript of an interview with Trump in which he mused on nuclear war without question. And there were so many other topics covered. And it was fact-checked, which resulted in, to no one’s surprise, a bunch of falsehoods. The usual fall-out was everywhere: Is he intentionally lying, covering up his ignorance, suffering from Dunning-Kruger, dim, or insane? Or all of these? A combo? For not finding many or any penetrating questions, folks were up in arms, accusing the New York Times of bad journalism, depauperate standards, failing our democracy, failing Americans. Others defended the newspaper, saying that the transcript of Trump speaking should speak for itself, and powerfully so, no matter how incoherent it is, and precisely for that reason. There was a time that I would be in the frustrated Ask Trump a damn penetrating question! camp. But now I am ambivalent. And it’s not because I’m hopeless. It’s because of a gorilla who loves kittens, how she’s portrayed and publicized, and what I can read between the lines about what’s going on between her ears. *It’s those most recent threats in last night's Button Tweet that prompted me to post this here, rather than attempt to get it in the Washington Post as originally planned. If I learned anything as a writer in 2017 it’s that while Trump is keeping writers busy, he’s keeping journalists and editors even busier.